Ice in January 2009 A picture showing the trials and tribulations of working outdoors in the winter. When the mechanical team climbed up onto the power unit to remove its tarpaulin on the 11th January, they found that water had collected on the tarpaulin, causing it to sag into the V space in the top of the power unit. 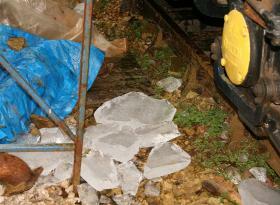 More water had then collected and the resultant cold weather had frozen it. The lads had to remove 3" thick ice from this space. Fortunately, because it was basically being contained by the tarpaulin, and not the engine, no damage was done. But it wasn't the most pleasant of jobs. February saw one of the work parties cancelled due to the snow. A picture showing the trials and tribulations of working outdoors in the winter. When the mechanical team climbed up onto the power unit to remove its tarpaulin on the 11th January, they found that water had collected on the tarpaulin, causing it to sag into the V space in the top of the power unit. More water had then collected and the resultant cold weather had frozen it. The lads had to remove 3" thick ice from this space. Fortunately, because it was basically being contained by the tarpaulin, and not the engine, no damage was done. But it wasn't the most pleasant of jobs. February saw one of the work parties cancelled due to the snow.